We arrived back from Magic Beach to find four zucchinis sitting on our kitchen bench, put there by my lovely mother in law who had looked after our garden while we were away. I inwardly groaned because I just know that it is the start a few months of being innundated with zucchinis, squash, tomatoes, and cucumber (just to name a few). It’s not that I don’t like zucchinis. The first 30 or so are fantastic. Unfortunately, as regular readers of this blog will know, our garden doesn’t produce just 30 zucchinis. No due to Country Boy’s enthusiasm for gardening, we are more likely to have 30 zucchinis each day. I wish I were joking. We do sell some of our extra vegetables in the village, but I still struggle to find interesting things to make with them all. This year I am determined to make some new tastier dishes from all our vegetables. I will be hitting pinterest with a vengence. In the mean time, I whipped up these little treats for dinner. They were wolfed down by the kids, so I suggest that I am on to a winner. 6 regular zucchinis (or 3 monsters if that is what you have on hand). 1t fresh thyme leaves (use dried if you don't have any). Place the parmesan cheese in a tray with the mixed herbs, cayenne pepper, thyme leaves, and some salt and pepper. Mix together. Place a wire rack over a baking dish. Spray the zucchini lightly with oil. 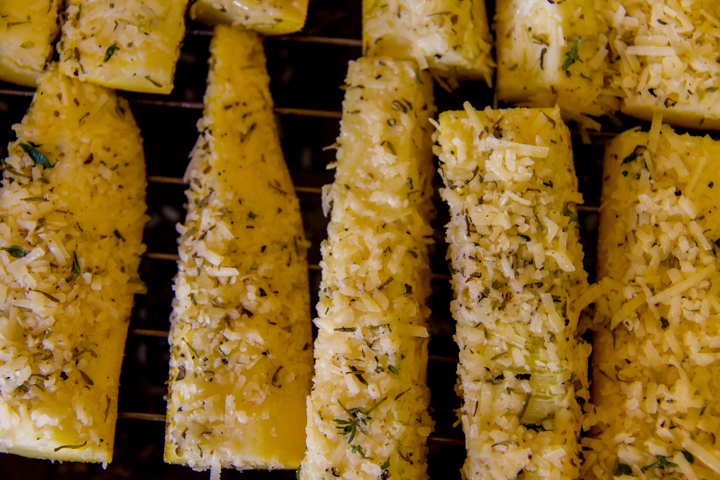 Roll the zucchini in the parmesan mix, so that it gets well coated. Press it well to help it stick. 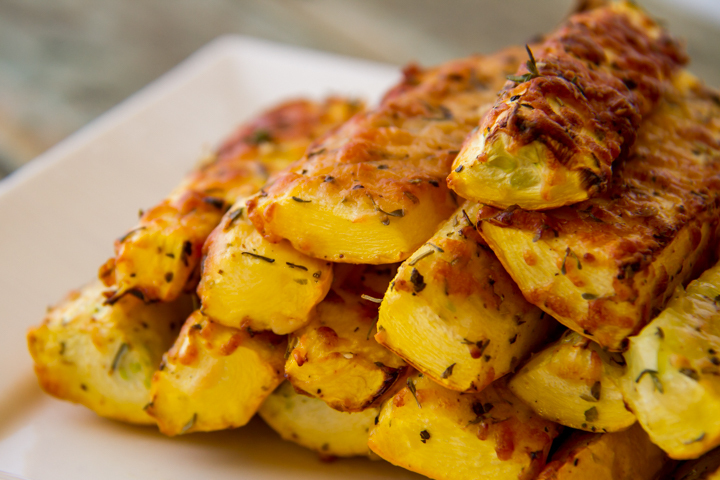 Bake in the oven for 20 minutes until the cheese has gone golden and crisp. Got any good zucchini recipes? Do share please! 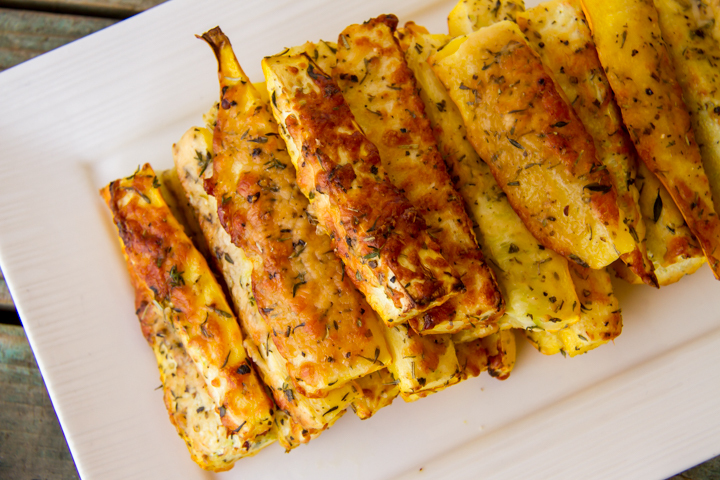 These look absolutely delicious – and I have a huge crop of zucchini at the moment that your recipe will be perfect for! Thanks for contributing to The Sunday Brunch Magazine! Doesn't time fly. I'm glad you've got the link up going again. Thanks for featuring it! Jo, it's been such a long, long time. I was so happy to see this blog post linked up to Thriving on Thursdays last week. I was very slack (or busy, whichever way you look at it) in 2014 and didn't get around to many blogs. I'm glad I've got the linky party back so I can get back in touch with friends like you. The blog looks fantastic and your photography is so good. Thanks again for linking up. I'm featuring this one at tomorrow's party. River Cottage book on vegetables has hundreds of recipes just for vegetables. Available from Book Depository. There is another very thorough vegetable book by Jane Grigson as well but I prefer Hugh's. They seem more practical and family sensible.